Have you ever used squash as a bowl? 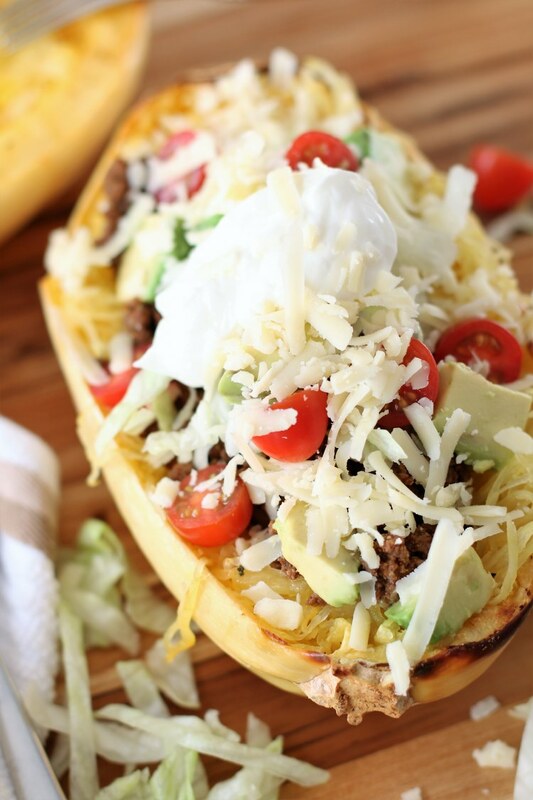 Anyway, let’s talk about what’s actually in these spaghetti squash bowls. If you’re familiar with my blog then you know that my husband and I are fans of Mexican food. My husband’s answer to pretty much any question is a taco. And why not? Tacos are delicious. 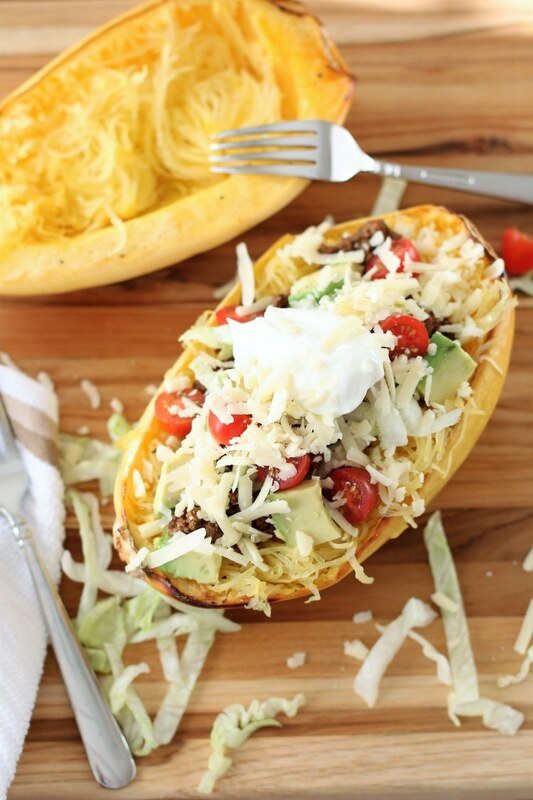 Soooo, I turned these spaghetti squash boats into something that resembles a taco. 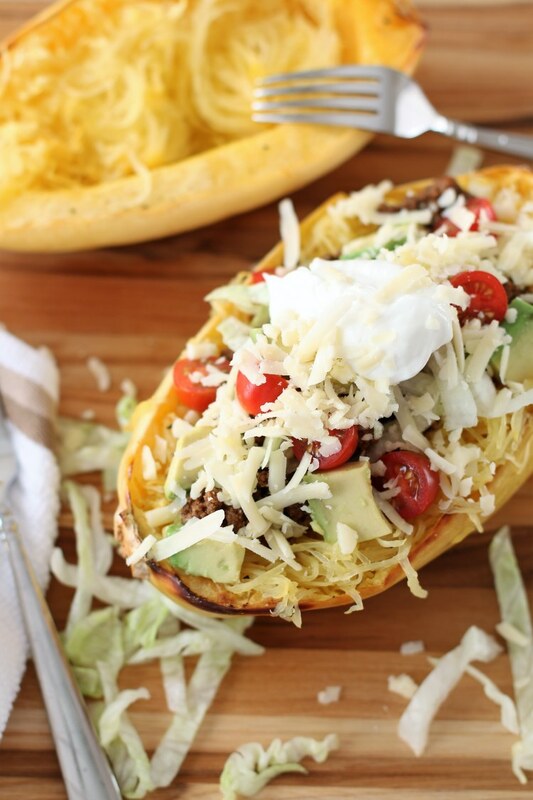 I’m skipping the fun (but carb filled) taco shell and using spaghetti squash instead. To clarify, these definitely don’t taste like tacos… Just saying. But these are freaking delicious and not to mention healthier. To prepare the spaghetti squash, slice it in half lengthwise. Scoop out the seeds and pulp from the middle. Place the squash on a baking sheet, cut side up. Drizzle the oil over both halves sprinkle with salt and pepper. Bake the spaghetti squash for about 1 hour or until the flesh is tender. Remove the squash from the oven. In a small bowl, mix together the water and taco seasoning and set it aside. In a skillet, over Medium heat, add the ground beef. Pour the taco seasoning mixture on top and mix it all together. Use a fork to scrape the squash into strands. Add half of the beef mixture on top of the strands. Add the toppings of your choice on top.